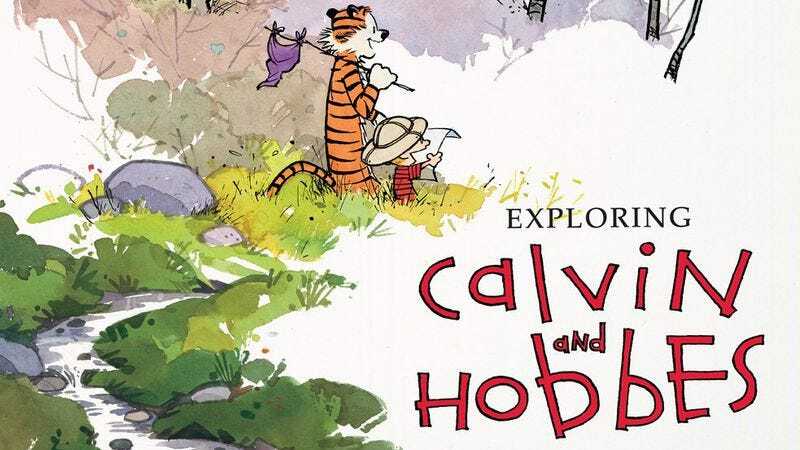 In anticipation of the release of Exploring Calvin And Hobbes: An Exhibition Catalogue, The Washington Post has published excerpts from the long-ranging interview with the strip’s creator, Bill Watterson, that accompanies the book. In the interview with Jenny Robb of the Billy Ireland Cartoon Library & Museum, Watterson forgoes his usual taciturn approach to public comments and divulges his thoughts on a number of topics ranging from his own artistic approaches, what he thinks of his prolific creation, and even his thoughts on the rise of the digital comic. It’s a fascinating read that contains glimpses into Watterson’s own childhood and inspiration for the comic, and how people tend to read profundity into his strips because “[i]f you draw anything more subtle than a pie in the face [in comics], you’re considered a philosopher.” The Washington Post piece is a great preview and compelling teaser for the book, which is available for purchase now, as it shows the vast multitude within a man reluctant to step back into the public eye. While it’s impressive that Watterson has let his work speak for itself for two decades without much commenting, this interview provides immense insight into a man whose creations were both singularly unique and oddly universal, touching the lives of millions of people to this day, years after it has ceased publication. While Watterson may shy away from being branded a philosopher or the depth ascribed to his work, it’s clear he has much to say that will further illuminate his incredibly iconic and influential work even now. Here’s The Washington Post article to read more about his many thoughts.